Elisa is not your typical heroine. She is overweight, plain, a bookworm who is unsure of herself and lingers in the shadows of her confident older sister. She would be completely overlooked were it not for the fact that she’s a godstone bearer, someone who is born once every hundred years with a magical gem in her bellybutton. At first, I was a bit skeptical of this troll doll-esque jewel in her stomach, but I have to admit that it was a unique touch by Rae Carson, a writer whose first novel stands apart in the fantasy crowd. The godstone promises great things, but Elisa isn’t sure what those are yet, or if she’ll be able to recognize her act of service when the time comes. She definitely wishes that she was not a bearer, feeling trapped by a destiny she doesn’t fully understand. Elisa’s connection to her godstone reminded me of Harry Potter’s scar. He’s infamous for something he had no control over as a baby, and is saddled with great expectations for the rest of his life because of it. The book opens on Elisa’s wedding day when she is about to walk down the aisle and marry a stranger, a neighboring (handsome) king who’s banking on the promise that Elisa’s godstone will help save his country from a horrible war. She’s a bundle of nervous energy and uncertainty; a vulnerable young woman who is quite different from many other fantasy heroines who are already self-possessed and sure of themselves upon first introductions. Elisa compensates for her lack of control over her body (including the godstone and her weight) by burying herself in books and sharpening her knowledge of military strategy and history. As the story unfolds, it’s this intelligence that enables Elisa to determine her own fate, as she assembles the puzzle of her godstone, saving her time and again, in the face of danger. I must admit, I was slightly disappointed during Elisa’s journey to come in to her own, when she shed all of her extra weight. I was just so relieved to finally encounter a female protagonist who didn’t have a perfect, lithe body that I would have preferred that Elisa kept her unique shape and developed a sense of self worth. That being said, I do think Carson treated Elisa’s physical and emotional transformation delicately. It was a gradual process that didn’t happen overnight, and lead me to think about how a sense of emotional well being is often tied to the physical. 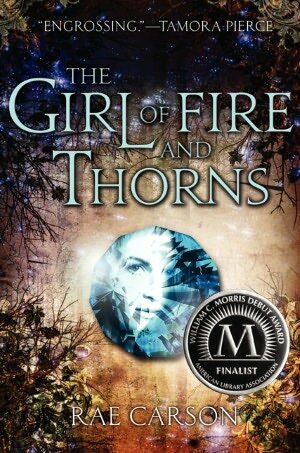 The Girl of Fire and Thorns surprised me in its distinctive approach to crafting the ‘fantasy female lead character’ in the same vein as Kristin Cashore’s Bitterblue. I was also drawn to Carson’s world building, plot twists, flawed character relationships, the role of magic, and questioning of religious zeal. Elisa’s story continues in The Crown of Embers, which comes out September 18th.